You're invited to a Multi-Chamber Event! 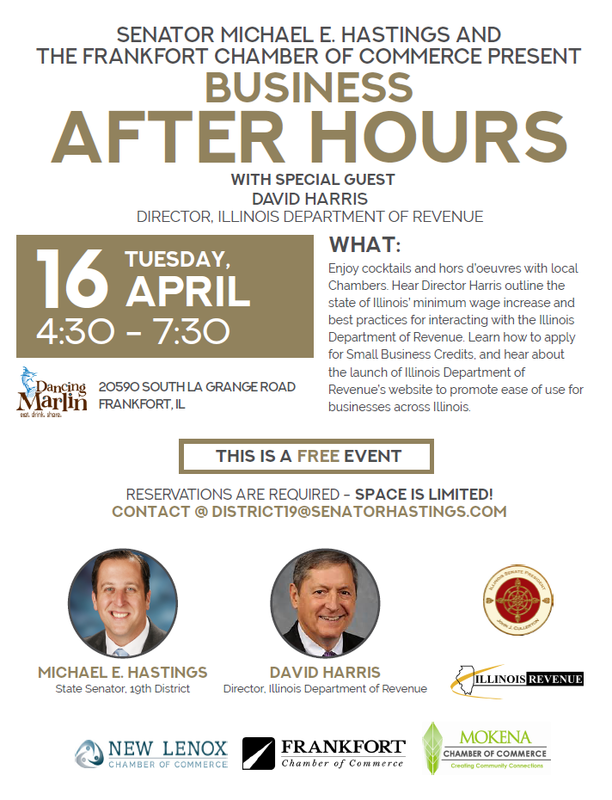 Join the New Lenox, Frankfort and Mokena Chambers as we partner with Senator Michael E. Hastings for Business After Hours! And don't forget -- you get rewarded for registring and attending events in 2019! Members that pre-register and attend any Business Before/After Hours, Ribbon Cutting, Luncheon or Breakfast Program, you'll receive two entries into the raffle. If you attend an event without registering, you will get one entry. At the 2019 Jingle & Mingle Holiday Party, we will select a winner. That business will receive a $75 discount on their 2020 membership dues! RSVP ONLINE TODAY!! End the work day right by making new connections at Business Before Hours!